La'o Hamutuk was founded on 20 May 2000, and we will celebrate our eleventh anniversary on Friday, 27 May 2011, starting at 4 pm. This party will also inaugurate our new office on Rua dos Martires da Patria in Bebora, Dili, across from San Carlos school. We want to say "thank you" and "welcome" to all our supporters, colleagues, neighbors and friends, and hope that you will join us for this happy event. La'o Hamutuk hahu iha loron 20 Maiu 2000, no ita sei selebra aniversariu ba dala sanulu-resin-ida iha loron Sesta, 27 Maiu 2011, hahu tuku 4 lokraik. Festa ida ne'e mos sei inaugura ami nia eskritoriu foun, iha Rua dos Martires da Patria iha Bebora, Dili, iha Eskola San Carlos nia oin. Ami hato'o dahuluk ami nia "Bemvindo" no agradesimentu ba La'o Hamutuk nia apoiante sira, kolega sira vizinu sira no belun sira, no konvida ita boot sira hotu atu partisipa iha eventu haksolok ida ne'e. Obrigado ba ita boot nia partisipasaun. 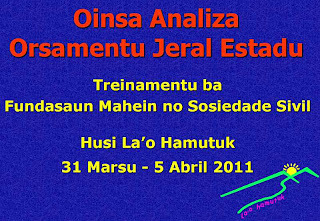 Iha fulan Marsu no Abril tinan 2011, La’o Hamutuk koopera hamutuk ho Fundasaun Mahein no Asosiasaun HAK, hodi halo treinamentu kona-ba Orsamentu Estadu 2011 durante loron tolu nia laran ba Sosiedade Sivil sira ne’ebe nia baze iha Dili no mos balun husi distritu sira hanesan Lautem no Oe-cusse. Treinamentu ne’e foka liu ba seitor defeza no seguransa, seitor ne’ebe Fundasaun Mahein no Asosiasaun HAK tau-matan ba, maibe treinamentu ne’e mos inklui konseitu balun ne’ebe relevante ba Orsamentu Jeral Estadu nian hodi ajuda sosiedade sivil sira atu oinsa halo analiza. 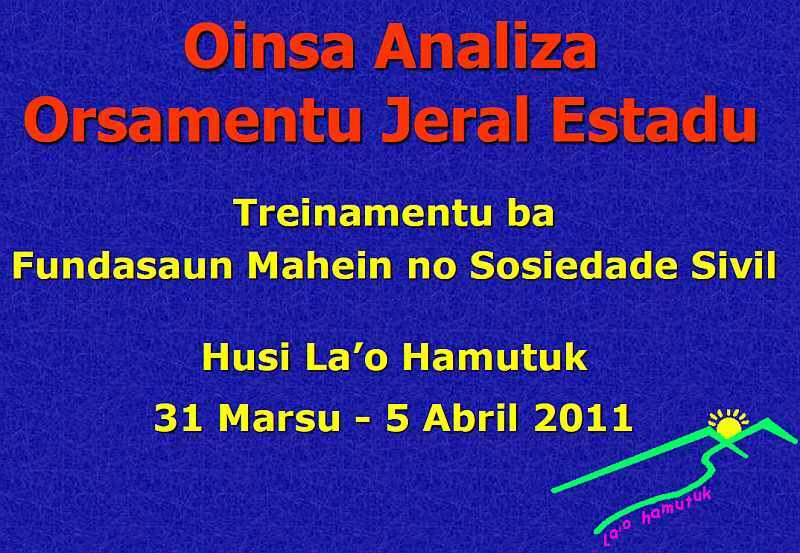 Ami tama aprezentasaun Powerpoint no dokumentu ruma husi treinamentu ida ne'e iha La'o Hamutuk nia website, atu fahe informasaun ba ema hotu. Ami mos iha planu atu fo treinamentu tan kona-ba asuntu importante ida ne'e. Inklui fundasaun legal, konseitu legal, gastus no reseitas ba orsamentu, Fundu Espesial no ezekusaun orsamentu. Topiku ne’e atu ajuda partisipantes sira hodi bele asesu ba informasaun kona-ba alokasaun, gastus no reseitas OJE nian, no mos informasaun seluk ne’ebe sira presiza relasiona ho sira nia fokus area. 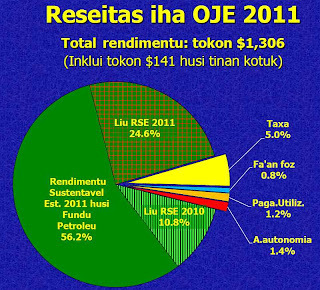 Informasaun ne’ebe uza tenke mai husi dokumentus legal ka formal, bai-bain mai husi instituisaun estadu, hanesan website Ministeriu Finansas, Autoridade Nasional Petroleu, Autoridade Bankaria no Pagamentu (BPA), Jornal da Republika, no Portal Transparansia. Aleinde ne’e, iha mos informasaun sira ne’ebe mai husi organizasaun ne’ebe halo analiza, ezemplu website La’o Hamutuk, FMI, Banku Mundial, UNMIT no relatoriu Komisaun C Parlamentu Nasional. No mos bele uza informasaun sira ne’ebe mai husi media no politikus nain sira, maibe labele fiar lalais ba informasaun sira ne’e, presiza kompara didiak ho dokumentus legal, tamba dala ruma la konsistente ka reprezenta deit sira nia interese politiku. Topiku ne’e koaliu liu asuntu sira ne’ebe iha relasaun ho kriasaun Fundu Infraestrutura, PEDN, ADN, ezekusaun orsamentu, gasta liu ESI (Fundu Petroleu), revizaun Lei Fundu Petroleu, osan restu (balansiu) husi tinan orsamental kotuk, portal transparansia, sustentabilidade ekonomia, imprestimu no debe. Bele liga ba website La’o Hamutuk atu hetan material aprezentasaun no pajina web kona-ba Orsamentu Jeral Estadu 2011 nian. Hafoin hakerek relatoriu ne’e durante tinan tolu nia laran, Programa Nasoens Unidas nian ba Dezenvolvimentu (UNDP) publika ona sira nia Relatoriu Dezenvolvimentu Umanu ba dala tolu ba Timor-Leste, Jere Rekursu Naturál ba Dezenvolvimentu Umanu: Dezenvolve Ekonomia Naun- Petrolífera hodi alkansa ODM sira (English). 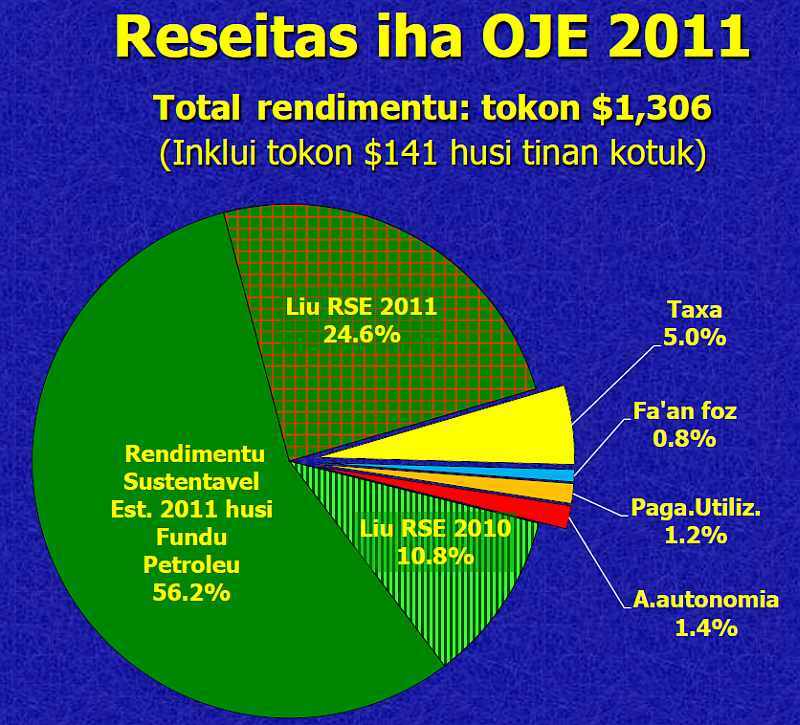 Relatoriu ne’e lansa husi Prezidente Republika Jose Ramos-Horta iha 3 Maiu 2011, ho observasaun husi chefe UNDP nian Finn Reske-Nielsen, ekonomista Rui Gomes, Dr. Rui Maria Araujo (Konseilu Estadu), Deputadu Joaquim Amaral, Reitor UNTL Aurelio Guteres, no Charles Scheiner husi La’o Hamutuk. UNDP distribui Sumariu Ezekutivu (mos iha Ingles), Komunikadu Imprensa ida (mos iha Ingles) no sumariu estatistiku (mos iha Ingles). Xina nudar nasaun uniku mak atinzi kresimentu GDP double-digit longo prazu, no Timor-Leste tenke halo planu ho metas ne’ebe realistiku ne’ebe menus husi 7%. UNDP muda oinsa kalkula Indeks Dezenvolvimentu Umanu hodi uza GNI duke GDP no tinan eskola nian duke alfabetizasaun, ne’ebe redus tiha nia utilidade ba ekonomia ne’ebe dependente maka’as teb-tebes ba eksportasaun petroleum ho laiha esperiensia ho rekursu ne’ebe oituan. Ohin loron Timor-Leste halo gastus barak ona kompara ho tinan 2009, bainhira mayor parte husi dadus relatoriu nian ne’e rekolha ona. Dotasaun ba edukasaun no saude tun husi 15.6% ba 9.6%, maske nasaun sira ne’ebe halo progresu atu atinzi Objetivu Dezenvolvimentu Mileniun (MDGs) gasta 28% sobre investimentu esensial sira ne’e ba umanu. Populasaun Timor-Leste nian rapidamente sae, labarik sira ho idade menus tinan 10 barak liu dala rua kompara ho jovens sira ho tinan 20-29. Ohin loron ema 15,000 sei tamba ba forsa trabalho nian kada tinan, iha 2023, bainhira Bayu-Undan maran tiha, numeru ne’e sei sae ba 34,000. Total rikusoin petroleum Timor-Leste nian limitadu teb-tebes, no nia rendimentu sei labele finansia aktividade estadu nian iha futuru hanesan nivel ohin loron $2.65/kada ema/kada loron, mesmu ho hipotezes ne’ebe optimista. Politika gastus ohin loron nian sei hamamuk Fundu Petroleu iha tinan 2030. Tuir ligasaun iha leten atu hetan informasaun, dokumentus no referensia ne’ebe kompletu kona-ba kestaun kritika sira ne’e. After three years of work, the United Nations Development Program (UNDP) has released its third Human Development Report for Timor-Leste, Managing Natural Resources for Human Development: Developing the Non-Oil Economy to Achieve the MDGs. The report was launched by President Jose Ramos-Horta on 3 May 2011, with observations by UNDP head Finn Reske-Nielsen, economist Rui Gomes, Dr. Rui Maria Araujo (Council of State), Deputadu Joaquim Amaral, UNTL Rector Aurelio Guterres, and Charles Scheiner from La'o Hamutuk. UNDP distributed an Executive Summary (also Tetum), a Press Release (also Tetum) and a Statistics summary (also Tetum). China is the only nation which has achieved long-term double-digit GDP growth, and we should plan with realistic goals of less than 7%. UNDP changed how it calculates the Human Development Index to use GNI instead of GDP and years of school instead of literacy, which reduces its usefulness for Timor-Leste's extremely petroleum-export-dependent economy with an inexperienced, under-resourced educational system. 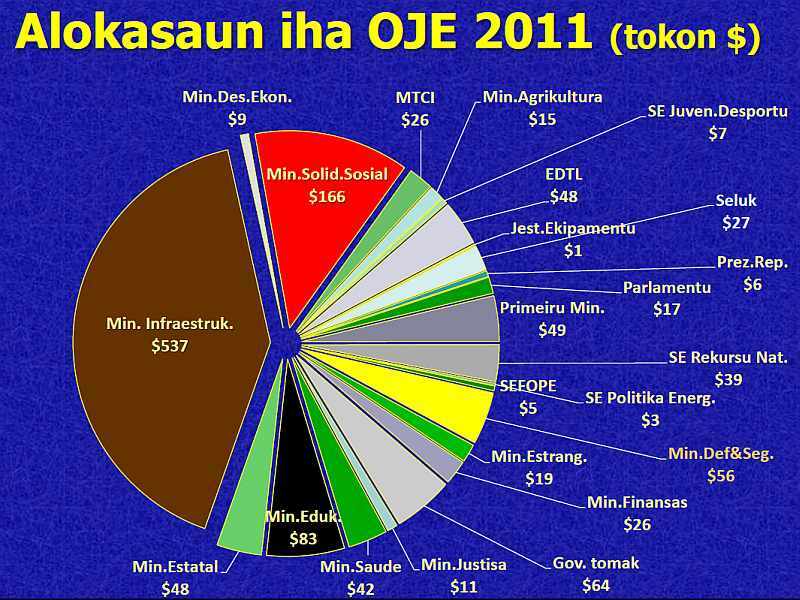 Timor-Leste spends much more now than in 2009, when much of the report's data was collected. The allocation for education and health dropped from 15.6% to 9.6%, although countries making progress toward the MDGs spend 28% on these essential investments in human resources, Timor-Leste's population is growing rapidly, and there are twice as many children under 10 as young adults aged 20-29. Today 15,000 people enter the labor force every year; in 2023, when Bayu-Undan is exhausted, it will be 34,000. State activities at today's levels of $2.65/person/day, even with optimistic assumptions. Current spending policies could entirely empty the Petroleum Fund by 2030. Follow the links above for more complete explanation, documents and references on these critical issues. For Tetum, more up-to-date information and documents see La'o Hamutuk's web page on this process. During the last two years, Timor-Leste has become one of the leaders of international processes relating to "Fragile States" and aid effectiveness. In 2010, Dili hosted an "International Dialogue on Peacebuilding and Statebuilding," and a follow-up conference will be held in Korea later in 2011. The National Directorate for Aid Effectiveness in the Ministry of Finance is consulting people on Timor-Leste's Country Paper for this process, and received comments on a mid-April draft by 6 May. La'o Hamutuk made a submission, as have others.